KE00022 is a solid phase sandwich Enzyme Linked-Immuno-Sorbent Assay (Sandwich ELISA). 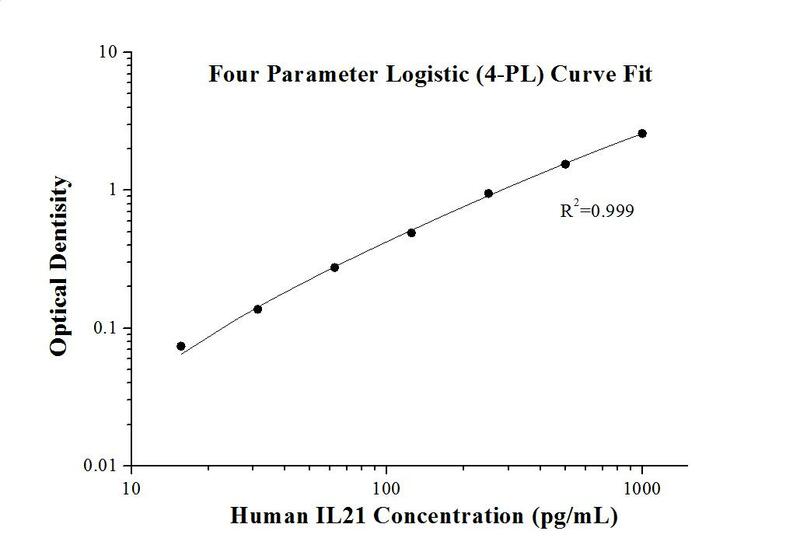 The IL21 ELISA kit is to be used to detect and quantify protein levels of endogenous IL21. The assay recognizes human IL21. A monoclonal antibody specific for IL21 has been pre-coated onto the microwells. The IL21 protein in samples is captured by the coated antibody after incubation. Following extensive washing, a monoclonal antibody of biotinylated specific for IL21 is added to detect the captured IL21 protein. For signal development, Sterptravidin-HRP is added, followed by Tetramethyl-benzidine (TMB) reagent. Solution containing sulfuric acid is used to stop color development and the color intensity which is proportional to the quantity of bound protein is measurable at 450nm with the correction wavelength set at 630 nm. Interleukin 21 (IL21) is a cytokine produced predominantly by cluster of differentiation 4 (CD4+) T-cells and natural killer T-cells. IL21 is preliminarily expressed in activated cluster of differentiation 4 (CD4+) T-cells and natural killer (NK) T-cells. IL21 receptor (IL21R) is a class I cytokine receptor, which requires dimerization with the indispensable common gamma chain (γc) subunit to bind IL21. IL21 plays a role in both the innate and adaptive immune responses by inducing the differentiation, proliferation and activity of multiple target cells including macrophages, natural killer cells, B cells and cytotoxic T cells. IL21 mediates apoptosis in B-CLL cells through up-regulation of the BIM (BH3 family member) and enhances both direct and antibody-dependent cellular cytotoxicity in these cells.